Are you or your clients interested in performing a cost segregation study as we look toward 2018 tax filing deadlines? If so, now is the time to get started to meet the March 15th tax deadline. KBKG is committed to timely work, and we are starting to get busy with Cost Segregation projects. Help us serve you better by notifying us at your earliest convenience that you or your clients will be participating in this tax-saving strategy. 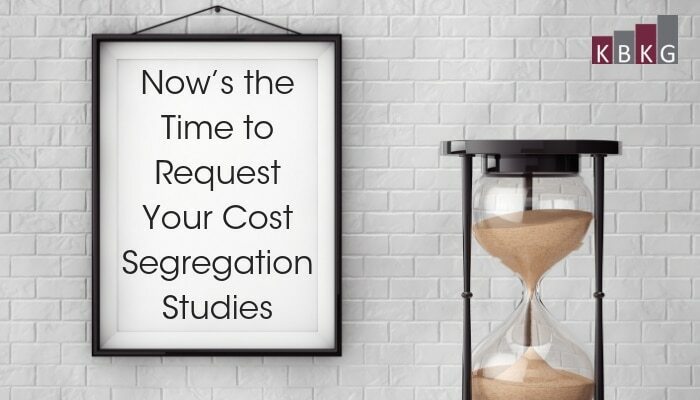 A quality Cost Segregation study evaluates all information, including available records, inspections, and interviews, and presents the findings in a clear, well-documented format. Our process for conducting a detailed Cost Segregation includes a review of any available cost detail for the property, a review of any available blueprints and a physical inspection of the property. If none of this information is available, a Cost Segregation study can still be performed by estimating component values on site. While a typical Cost Segregation study takes anywhere from 45-60 days to complete, this truly depends on how quickly our team receives the information needed to get started. We understand that tax season is busy, and we do what we can to minimize time and effort on your part to finalize the study. Every building is different. Savings depend on many factors including purchase price, building use, design, and year acquired. An estimate of savings can easily be obtained through our Cost Segregation Savings Calculator. For a more accurate estimate, you can Request a Free Analysis and Proposal. Generally, the savings is roughly 25 to 35 times the cost of the Study. A Study is generally beneficial if the property is not operating at a loss and is generally applicable unless the property is a non-profit organization. Ready to get a head start on tax season? Help us, help you by notifying us as soon as possible if this is something you are interested in pursuing. ← Own a Start-up or Small Business? You May Qualify for Federal Research Credits.